I am sure there are many people like me; folks who are well aware that the chaos and confusion that we see in the world is not only increasing, but actually must happen in order to usher in the return of our Lord. By this confession, I'm sure I'm not telling you anything you don't know. But I also know that feeling the intensity of escalating events can lead to some sleepless nights. Just today, I woke up in the early hours of the morning -- a little past 4:00 -- and could not go back to sleep. I felt such a heaviness and oppression, and was aware of a sense of impending doom; like world events are cascading in upon each other and will soon erupt into a worldwide conflagration. I know, I know ... that is not exhibiting the hope and peace that I should have in knowing God is in control of all events, and my eternal future is secure. But when these sleepless periods come, it's not so much fears over my personal safety that keep me awake, but I can't keep my mind from being concerned about all my loved ones, or being aware of the horrendous persecution of people of faith around the world. How is it possible to escape the headlines each day? They are not to be ignored ... Russia and Syria forming a strong alliance; Chinese warplanes joining the battle against ISIS; Iran declaring hatred and annihilation of America and Israel; Oil reserves discovered in the Golan Heights (which could certainly be the "hook" that draws the nations into the Gog-Magog war ... and on and on. It all seems to be aligning with Biblical prophecy. As I laid in bed, binding those destructive thoughts and taking them captive, I was reminded of a dream that I had nearly 6 or 7 years ago. It was so intense and so real, that I knew it was spiritual in purpose. In this dream, I was on a beautiful beach with nearly pure white sand, and situated in a cove. On one side of this cove, the land formed a peninsula that jutted out into the ocean, but I was protected from the roaring sea in this quiet cove. Then I became aware of a strange object in the water of this coastal inlet, and as only seems logical in dreams, I recognized it as a ferris wheel. At this point, I must tell you that I am not really comfortable in deep water, so it is understandable that I approached the ferris wheel in my dream with some trepidation. But I finally climbed into one of the buckets and it began its climb towards the sky, where I could see the beauty of the calm water before me. But as it descended, I knew I was going to have to brace for an entrance into the deep water of the cove, before the rotation of the ferris wheel continued its circular motion. So, I experienced several rounds of relaxed enjoyment, followed by the anticipation and fear of going underwater. Looking back at this dream, I believe this was representative of what I have faced over the last years as God has awakened me to the knowledge that we are in the Last Days... periods of calm, serenity, and confidence, followed by times of fear, anticipation and dread as He revealed more of how He wants me to spiritually prepare. But then the dream took a different turn. I exited the ferris wheel, and ventured to walk from the cove and around to the other side of the peninsula. I felt drawn to the open sea, even though the sheer size and mass of the ocean frightened me. I stood looking at the ocean, mesmerized by its power, and then I noticed far-off in the distance, a small wave approaching. I stood there, almost hypnotized, watching this wave growing as it approached me until, shaken from my stupor, I realized that the swelling waves were going to swamp the shore on which I stood. Despite being fearful of the ocean and deep water, I knew that I had to try to escape and swim to safety. The next thing I became aware of in my dream was swimming as hard as I could and looking back over my shoulder to see that wave coming ever closer with such speed and height. At last it reached me and came crashing down on top of me, tumbling me over and over, and dragging me into the depths of the ocean. I was so scared, and fought to hold my breath, finally resigning myself to the fact that I was going to drown. Even in my dream state, I could feel my heart beating wildly and could sense my acceptance of death. Then I felt strong arms scooping me up in those deep waters, and of being cradled. I heard a voice say, "It's all right. There's no need to be afraid. I have you." Then I had a fleeting moment of such profound peace, freedom from fear, and of being completely loved before waking up. 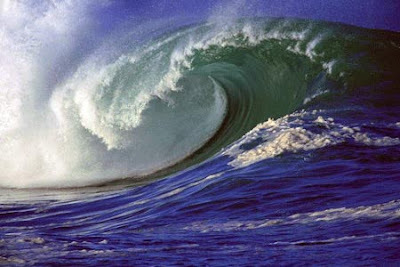 I know, without a doubt, that this dream was confirming that, yes, there is a wave building across the globe, and it will come crashing down upon the world. There will be moments of panic and terror, but I am to rest in the knowledge that this fear will be fleeting. I will be secure in the arms of my Lord, who will literally save me from drowning in the chaos and evil of these days. Nothing has changed in the intervening years, since I had the dream, to give me a different insight into the prophetic meaning of it. Before our very eyes we are witnessing upheaval in our monetary systems, the erosion of independent sovereign nation states; and our social institutions and international relations are decaying. The institution of marriage, that began in the Garden of Eden, has been redefined. And the sanctity of life is sold for corporate profit. As Paul McGuire, a prophecy expert, describes the world, "It’s as if the world has been set on fire by chaos or crisis of every kind; financial crisis, terrorist crisis, racial crisis, moral crisis, religious crisis and even a crisis in our weather patterns." So I know that many of you are feeling the effects of what we are witnessing in world events. But I'm here to tell you we don't have to succumb to fear or paranoia. The love that I felt in that dream is real, and there is power and deliverance in it! We have been called by God, before the creation of the world, for a time such as this. He will see us through whatever is coming, and He has promised that the gates of Hell will not overcome us! Just remember this: that wave may have come crashing down on me, but I landed in the strong arms of my Savior and He assured me that He would not let go. If you belong to Him, His promise is the same for you! Psalm 118:16-17 The Lord’s right hand is raised. The Lord’s right hand performs valiantly! I will not die, but I will live and proclaim what the Lord has done. Amen sister, thanks for your faithfulness in the midst of the chaos. As believers we knew these days were coming. Its just when the "birth pangs" are so close and strong it can still be a bit unnerving. That is why we need to keep our focus on Christ and our fellowship with each other. Absolutely! And it's nice to know that there is a strong and faithful remnant that recognizes where we are in God's redemptive plan, and who we are. I am grateful to hear from such fellow believers as yourself! Dear Belle, Once again you echo my heart and it is interesting that I had a sense of foreboding this morning too. It is a beautiful day here in the pacific northwest, yet I sense the approaching escalation of evil in a different way than ever before. Such a contradiction to the beauty of the day. I also had dreams about water last night...water running down hill with increasing volume and power, pets being carried away or caught under frozen water...going on a "search and rescue" mission with my husband and stepping out into rising ocean water coming in over land. Thank you for listening to the Holy Spirit, and writing for the Lord. So often, what you write echoes my own concerns, perceptions, feelings that day. He has used you to warn, equip and encourage the saints. Keep standing in faith for Christ, and may God bless you and yours. Thank you for your encouraging words, but believe me, I am no different than you or any of the faithful remnant in these days... we all have been given a place to stand and I am simply occupying where the Holy Spirit has told me I can serve God's Kingdom. There are days I feel so ineffective and unworthy, but until I am told to stand elsewhere, I will rely on the Spirit to use my words to speak to those who will listen. I am sure that you, too, have a special place to stand-- encouraging your family, leading a Bible study, or being courageous in your profession of faith. Thank you for reaching out and connecting. It helps me to know that I am still on the right path.